We had a video recap from last week's action where Contra Unit attacked “Filthy” Tom Lawlor after the champ had successfully defended the MLW World Heavyweight title against Low Ki inside a steel cage. Austin told us in an in-set promo that he is going to the Battle Riot as he always has an ace up his sleeve -- and he certainly pulled one out here. A relatively short, but very good match between these two athletic middleweights. Arm twists and wrist holds started us off. Austin went for a few quick roll-ups, but DJZ had his number each time. On the floor, DJZ blocked a soccer kick from Austin from the apron, but Austin escaped his grasp with a cartwheel before smoothly transitioning into the ring and back out through the ropes to connect with a dropkick to the face. Still on the outside, DJZ whipped Austin to the guardrail, but Austin leapt over and into the crowd to dodge. DJZ followed up and launched himself over the rail with a flying shoulder block. Back in the ring, DJZ hit Austin with a springboard back elbow and went for a forward roll into a DDT, but Austin reversed that into a gutbuster. He then sat DJZ on the top and from the apron leapt up and brought him into the ring with a reverse frankensteiner. Austin followed up with a leg drop from the top rope but was only able to get a two count. DJZ was back in the match after hitting a double up-kick while flat on his back and then back suplexing Austin, twisting him in mid-air and landing him face-first onto DJZ's knee. DJZ couldn't believe he only got a two count, but he looked like he was getting closer to the win. DJZ leapt to the top for another back elbow, but Austin transitioned in mid-air and planted him with a uranage. After an exchange of kicks and dodges, Austin found himself on the top rope and ate a powerbomb for his troubles. Austin looked in bad shape as DJZ lined him up, forward rolled, and looked to finish him off -- but as DJZ rolled and sprang to his feet, Austin met him with a standing blockbuster to pick up the victory. - Salina de la Renta was backstage being asked about her plans, but she accidentally ended up covered in light beer when she turned and bumped into Mance Warner. De la Renta left pissed off, but Warner was equally as pissed as he had lost a cold one. - Dr. Nelson Sweglar was then on the phone with Rich Bocchini saying Tom Lawlor has suffered fractured ribs, blood in his lungs, a swollen spinal cord, and a possible subdural hematoma. He is not sure when Lawlor will be cleared to return to the ring. - Kaci Lennox was backstage with Mance Warner. He said that last week he got that W, hit that pay window, and got the cash. He called out Tom Lawlor -- he wants his gold, LA Park -- he will poke his eyes out through his mask, and Teddy Hart -- he was locked up with him before and will go with him again in the ring. 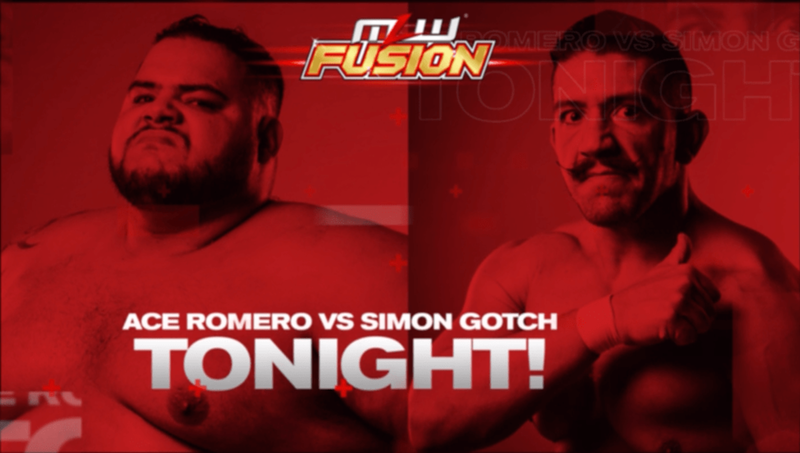 - We had a pre-taped promo from Contra Unit member Simon Gotch next. He was angry that Ace Romero took his $20,000 after Romero beat him a few weeks ago. But tonight he will find out the difference between a man fighting for money and a man fighting for a cause. - We were then shown a recording from earlier where Alexander Hammerstone was interrupted on the phone when talking about a “dynasty” backstage. Hammerstone was asked about competing in the Battle Riot and confirmed he will be in the match. Hammerstone said that he will win it. - Ace Austin was backstage and told us that he will win the Battle Riot as he only needs one opportunity. We then saw a quick recap from Rich Swann's recent attitude change. Hammerstone continued his impressive start in MLW, but it wasn't as clear cut as it seemed. Velasquez showed great potential here and could be a good hand in the middleweight division. Velasquez came right out of the blocks hitting a dropkick, a high knee, and an enzuigiri. Hammerstone left his feet briefly when Velasquez low bridged him out of the ring, but any advantage was short lived as Hammerstone swiftly powerbombed his smaller opponent onto the ring apron. Back in the ring, a pair of knees to the head knocked Velasquez to the mat and a huge overhead head-and-arm suplex sent him flying across the ring. Velasquez stunned Hammerstone, though, as the big man then missed a splash in the corner, so Velasquez did not give up and hit a step-up kick and a running knee to the head. Velasquez's momentum was short lived, and he was quickly crotched on the top turnbuckle as Hammerstone regained his composure. Hammerstone joined him up on top to hit a massive delayed vertical standing suplex from the middle rope and finished him off with his Nightmare Pendulum for the three count. - MJF and Richard Holliday were backstage hyping up their Tag Team title match next week against the Hart Foundation. MJF was about to show us an after party “dynasty” style but ended up screaming at some runners about Beluga caviar. They said they are going to relax with a nice drive in their new wheels, which their parents had just bought for them. - El Hijo de LA Park ran into Mance Warner backstage (who was still drinking where he met Salina de la Renta earlier). They had a quick confrontation and ended up brawling away out of sight. Brian Pillman Jr. swooped in to take the free beer Ol' Mancer left. - Matt Striker gave us an updated list of the Battle Riot competitors: Ace Austin, Low Ki, Pentagon Jr., Davey Boy Smith Jr., NOAH's Minoru Tanaka, Teddy Hart, Alexander Hammerstone, MJF, Richard Holliday, and Ace Romero. - We then cut to a recorded interview with the Hart Foundation from earlier this week. They were asked about MJF and Holliday's tag team challenge. Smith said they were lucky that he wasn't there when they attacked Hart two weeks ago -- and he will break them when they step into the ring with the Hart Foundation. - We were then backstage with Salina de la Renta again. Hijo de LA Park stumbled into the picture looking the worse for wear after his altercation with Warner. De la Renta got on the phone and told “Ricky” that she has a task for him. A short match, but the post-match angle really developed the new Contra Unit and showed they really mean business. Romero looked good as always. For a man his size, he can do amazing things in and outside of the ring. Gotch got a big boot and right hands in from the start, but Romero just ran him over and knocked him down. Romero then missed a splash in the corner but rallied and pounced Gotch right out of the ring. The 400+ lbs Romero then unbelievably connected with a suicide dive through the ropes! Back in the ring, Romero missed another big splash in the corner and Gotch took advantage with kicks to the back of the head. A “Where's your mustache?” chant got Gotch's attention for a moment as the announcers mentioned his change of appearance. A step-up kick knocked Romero down, but it was only momentarily as he soon fought back up to his feet. Romero then picked Gotch up in an airplane spin position, but the referee called for the bell when Jacob Fatu and Josef Samael of Contra Unit hit the ring. A three-on-one beatdown ensued when all three stomped Romero in the corner. Samael soon brought out a spike and drove it into Romero's forehead! Samael continued to jam it into Romero's forehead time and time again. Officials couldn't get into the ring to stop them, and Bocchini and Jim Cornette were going crazy on commentary. Contra Unit put coins in Romero's eyes to send a message to the rest of the locker room. Cornette's voice was rising and rising as he said fans were trying to rush the ring to get at Fatu and Samael. Gotch finished by draping Romero in the Contra flag before eventually leaving the ring. We went off the air with EMTs in the ring attending to Ace Romero.